today I thought I’d share ‘my why’ .. my reason for blogging. at the chloe digital conference I attended last week we discussed a lot about ‘our why’ and the purpose behind why we do what we do. typically when I share my blog story, I begin by sharing why I started in the first place, but it isn’t exactly the same reason I keep doing it today. I love sharing my outfits, I have always been asked when I go places where I get my clothes/shoes/etc. and so it naturally made sense that I would document and share that information on a larger platform. in high school I tried SO many styles, I wore a wide variety of things and experimented with my hair colors and styles too – high school was a time where I (like everyone) was trying to figure out who I was and what I liked. at times (here I am 10 years later) I am STILL figuring that out – however I feel I have a much stronger sense of my own personal style and who I am. I’ve always been drawn to classic pieces, my favorite brands are J.Crew, Kate Spade and Burberry – very preppy based, classic silhouettes that play with color and pattern. literally my style in a nutshell! as much as I enjoy prints and colors, I’m also cautious about what looks good on me, and what I know I can get the most wear of in my wardrobe. I enjoy putting together pieces in my closet in a variety of ways. I’m not kidding, when I get dressed if I’ve worn a skirt I try really hard to pair it with a new top and shoe combination every time I wear that skirt. it’s like a fun game for me, and it really pushes me to use my wardrobe in the biggest way I can. 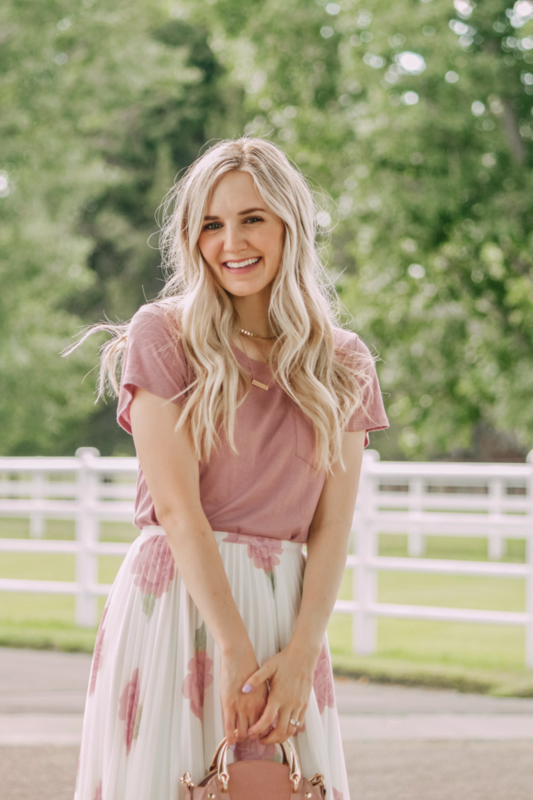 so this is something I love sharing with you – how to style your wardrobe to get you the most use of your classic / fun pieces! I feel like I’m almost there as far as having a minimalist attitude however, I just love shopping too much so I own too much to be considered having a ‘capsule wardrobe’. but I really do find joy in doing more with less. maybe one day I’ll commit to a capsule wardrobe. another avenue of why I do what I do is I didn’t see anyone doing what I’m doing, I don’t see women dressing modestly anymore. I want to be someone that girls and women can look up to – someone who is a beacon of that light. someone that my daughters will be proud of and excited to be like. I think I was given daughters so that I could ‘be confident’ and own who I am. I needed that boost, the boost that I know there are at least 2 little girls who need someone strong to look up to. that gives a lot of responsibility but also hope and I just feel love for the girls of the future. they are going to do GREAT things. my why is that I LOVE sharing my tips and tricks for pairing things together, getting fabulous deals on brands and being a positive role model for women! no matter what you do, figure out your why! why do you do what you do???? thanks for reading 🙂 all the love for you guys, have a blast this weekend! .a look back at 2017. Previous Post .the perfect summer to fall outfit.